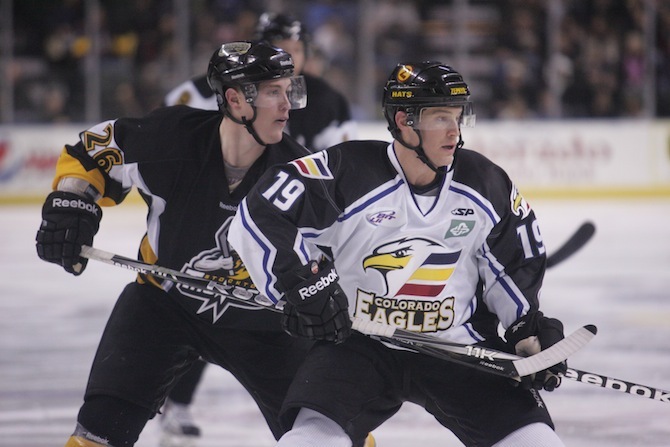 LOVELAND, Colo. – The Colorado Eagles stretched their winning streak to three games with a 5-2 victory over the Stockton Thunder, who had entered the game as the ECHL’s hottest team, featuring an 8-1-1 record in their past 10 contests. Steve Haddon and Joey Sides each had a pair of goals in the victory, while Kyle Jones picked up his 20th win of the season. Colorado took a 2-0 lead into the first intermission after out-shooting the Thunder, 14-8. The first goal came at 3:11 when Patrick Cey made a nice play along the right wing wall and then found Sides crashing the slot for a shot past Alex Stalock. The Eagles went up 2-0 at 11:53 when Jake Marto banked a pass off the neutral zone glass to spring Kevin Ulanski on a breakaway. Ulanski found a wide open Riley Nelson for a one-timer from the high slot. Those two nearly made it 3-0 on a similar play a minute and a half later, but Ulanski’s chance rung off the post. Haddon helped Colorado stretch that lead to 4-0 with a pair of goals in the second stanza before the Thunder got on the board by scoring with 19.2 seconds left in the period. Haddon picked up his first goal at 7:35 with a backhander from the right side of the crease. Less than eight minutes later, he made it 4-0 with a shot from atop the right circle that found its way inside the left post. Stockton’s Max Campbell rung a shot off the post in the final minute before re-collecting the puck seconds later, circling around the right circle and snapping a shot past Jones from the high slot. Midway through the third frame, Tommy Maxwell sent Haddon on a rush that saw the forward buy enough time for Sides to gain a step behind the Thunder defenseman before Haddon threaded a pass to him for a 5-1 lead. Jesse Fratkin would score the game’s final goal two minutes later to trim Colorado’s lead to 5-2.